Swallows, particularly cliff swallows, often live in close proximity to people. While enjoyable to watch, cliff swallows nesting in colonies on buildings and other structures can become a nuisance. Their droppings can foul machinery, create aesthetic problems, and cause potential health hazards by contaminating foodstuffs. Their mud nests eventually fall to the ground and can cause similar problems. In addition, swallow nests frequently contain mites and insects such as swallow bugs (Oeciacus vicarius); swallow bugs are related to bed bugs and will bite humans, although humans are not their usual host. Seven members of the swallow family breed in California. Barn and cliff swallows build mud nests attached to buildings and other structures, a habit that sometimes puts them into conflict with people. 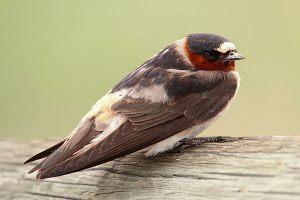 This is particularly true of the cliff swallow—the swallow of San Juan Capistrano—which nests in large colonies of up to several hundred pairs. In contrast, barn swallows tend to nest as single pairs and, consequently, do not cause many problems. The original nesting sites of cliff swallows were cliffs and walls of canyons. 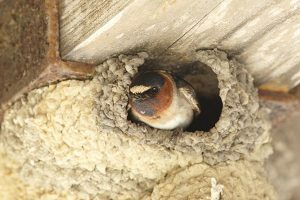 Structures, such as buildings, bridges, and overpasses, and agricultural activities have increased the number and distribution of suitable nesting sites, and cliff swallow populations have increased accordingly. Cliff swallows spend the winter months in South America. In late winter and early spring, they begin a northward migration through Central America and Mexico. Arrival dates can vary greatly because of weather conditions. The first migrants usually appear in southern California by late February or early March. Cliff swallow nests are gourd-shaped enclosed structures built of mud pellets, consisting primarily of sand with smaller amounts of silt and clay. The nest is cemented with mud under the eave of a building, bridge, or other vertical surface. Usually the first nests are located at the highest point possible with subsequent nests attached below it, forming a dense cluster. Both sexes construct the nest, proceeding slowly to allow the mud to dry and harden. Depending on mud supply and weather, nest construction takes 1 to 2 weeks. Egg laying usually begins before the nest is completely finished. Each day one egg is laid until the clutch of three to four eggs is completed. In central California, egg laying generally occurs between late April and the end of May. In southern California nesting can begin during late March. Both sexes incubate the eggs, which hatch in 15 or 16 days. The adults are kept busy feeding the nestlings by foraging over an area sometimes 2 to 4 miles from the nest. In California most cliff swallows raise one brood each year, although some may raise two. The time required from the start of nest building to departure after raising one brood is 47 to 64 days. Swallows are usually present at the colony for up to 100 days. All swallows are included under the Migratory Bird Treaty Act of 1918 as migratory insectivorous birds and as such are protected by state and federal regulations. It is illegal for any person to take, possess, transport, sell, or purchase them or their parts, such as feathers, nests, or eggs, without a permit. As a result, certain activities affecting swallow control are subject to legal restrictions. The California Department of Fish and Game, the enforcement agency, considers February 15 to September 1 to be the swallow nesting season. Completed nests during this breeding season cannot be touched without a permit from the U.S. Fish and Wildlife Service. Outside of these dates, the nests can be removed without a permit. Netting can provide a physical barrier between the birds and the nest site. The mesh size should be 1/2 to 3/4 inch for effective swallow control. It should extend from the outer edge of eaves down to the side of the building where protection from the elements given by the eaves is lost. Be sure there are no openings in the net where swallows might enter. Blocking the entrance will prevent cliff swallows from nesting inside buildings. Hang netting or strip doors of vinyl plastic or similar material across the entrance like a curtain, allowing passage of vehicles, materials, or people. Weighting the bottom of the netting will help keep it reasonably taut and in position during windy weather. Fiberglass panels known as “Bird Slide” that are 6 inches wide have been used to prevent nesting in some situations. The panels are installed between the eave and wall forming a smooth, concave surface that makes nest attachment difficult. Contact Wildlife Removal Services for all of your swallow control / prevention needs. We specialize in mud swallow removal, swallow cleanup, and swallow netting and bird slide installation. We follow all state and federal laws regarding the control and prevention of swallows on your home or business.